The two most important components of climate are temperature and precipitation. Regional climates can be classified according to these two components and other characteristics. The Köppen Climate Classification System is the most widespread system used to classify the climates of places and is the one that has been presented in this atlas. This system classifies a location’s climate mainly using annual and monthly averages of temperature and precipitation and comprises a total of 31 climate classes described by a code of letters. The first letter describes the main classes, the second letter accounts for precipitation and the third letter for temperature classes as seen in the table below. 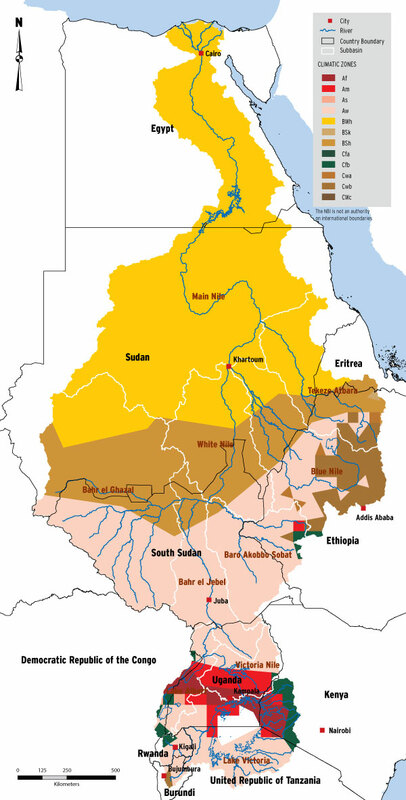 The basin is mainly dominated by tropical wet and dry climate in the equatorial lakes region and part of Ethiopia, sub-tropical dry arid (desert) in Sudan and Egypt, sub-tropical dry semi-arid in the southern part of Sudan as well as the tropical wet and tropical monsoonal around the Lake Victoria and some parts of the Ethiopian highlands. Here, only 12 out of 31 classifications which are reflected within the Nile basin have been fully provided. The basin extends over five climatic zones — Mediterranean, arid, semiarid, subtropical and tropical (Karyabwite 2000). Its landscapes range from mountains, grasslands, forests and woodlands, wetlands, lakes and desert to a wave dominated delta. This combination results in an array of ecosystems that are home to a rich biodiversity that provide a multitude of benefits to the population through cultural and ecological services, trade, tourism, food, medicines and other products. The Congo-Nile divide in Rwanda, the Fayoum lakes in the Egyptian desert, the Sudd wetlands in Sudan and the Albertine Rift on the border of the DRC with Uganda are some of the areas with a unique or rich biodiversity. The three sub-basins of the Nile (Equatorial lakes, Ethiopian plateau and Bahr El Ghazal) each receive extremely variable amounts of precipitation according to the climate zones in which they are situated. Rainfall and river flow records show that the basin has had its share of droughts and floods. These natural events have seriously impacted on the livelihoods of many people and the environment. Af Tropical Wet No dry season. The driest month has at least 60 mm (2.4″) of rain. Rainfall is generally evenly distributed throughout the year. All average monthly temperatures are greater than 18°C (64°F). Am Tropical Monsoonal Pronounced wet season. Short dry season. There are one or more months with less than 60 mm (2.4″). All average monthly temperatures are greater than 64°F (18°C). Highest annual temperature occurs just prior to the rainy season. Aw Tropical Wet & Dry Winter dry season. There are more than two months with less than 60 mm (2.4″) . All average monthly temperatures are greater than 18°C (64°F). BSh Subtropical Dry Semiarid (Steppe Low-latitude dry. Evaporation exceeds precipitation on average but is less than potential evaporation. Average temperature is more than 18°C (64°F). BSk Mid-latitude Dry Semiarid (Steppe) Mid-latitude dry. Evaporation exceeds precipitation on average but is less than potential evaporation. Average temperature is less than 18°C (64°F). BWh Subtropical Dry Arid (Desert) Low-latitude desert. Evaporation exceeds precipitation on average but is less than half potential evaporation. Average temperature is more than 18°C (64°F). Frost is absent or infrequent. BWk Mid-latitude Dry Arid (Desert) Mid-latitude desert. Evaporation exceeds precipitation on average but is less than half potential evaporation. Average temperature is less than 18°C (64°F). Winter has below freezing temperatures. Cfa Humid Subtropical Mild with no dry season, hot summer. Average temperature of warmest months are over 22°C (72°F). Average temperature of coldest month is under 18°C (64°F). Year around rainfall but highly variable. Cfb Marine – Mild WInter Mild with no dry season, warm summer. Average temperature of all months islower than 22°C (72°F). At least four months with average temperatures over 50°F (10°C). Year around equally spread rainfall. Cfc Marine – Cool Winter Mild with no dry season, cool summer. Average temperature of all months islower than 22°C (72°F). There are one to three months with average temperatures over 50°F (10°C). Year around equally spread rainfall. Csa Interior Mediterranean Mild with dry, hot summer. Warmest month has average temperature more than 72°F (22°C). At least four months with average temperatures over 50°F (10°C). Frost danger in winter. At least three times as much precipitation during wettest winter months as in the driest summer month. Csb Coastal Mediterranean Mild with cool, dry summer. No month with average temperature of warmest months are over 22°C (72°F). At least four months with average temperatures over 50°F (10°C). Frost danger in winter. At least three times as much precipitation during wettest winter months as in the driest summer month. Cwa Dry Winter, Wet Summer Mild with dry winter, hot and wet summer. Dfa Humid Continental Hot Summer, Wet All Year Humid with hot summer. Dfb Humid Continental Mild Summer, Wet All Year Humid with severe winter, no dry season, warm summer. Dfc Subarctic With Cool Summer, Wet All Year Severe winter, no dry season, cool summer. Dfd Subarctic With Cold WInter, Wet All Year Severe, very cold winter, no dry season, cool summer. Dwa Humid Continental Hot Summer, Wet All Year Humid with severe, dry winter, hot summer. Dwb Humid Continental Mild Summer, Dry Winter Humid with severe, dry winter, warm summer. Dwc Subarctic With Cool Summer, Dry Winter Severe, dry winter, cool summer. Dwd Subarctic With Cold Winter, Dry WInter Severe, very cold and dry winter, cool summer. ET Tundra Polar tundra, no true summer. EF Ice Cap Perennial ice.